Chocolate Peanut Butter Cupcakes. Yellow cake covered with sweetened peanut butter and chocolate ganache to mimic the Girl Scout Cookie favorite, the Tagalong. You’ve probably realized I have a love affair with Girl Scout cookies by now. I, once a long long time ago, was a loyal Brownie who went door to door selling cookies. And then eating cookies. 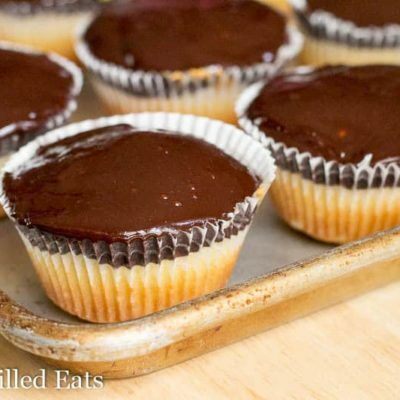 My Tagalong Cookies and Tagalong Bars are so delicious when I saw the recipe for Tagalong Cupcakes on a pin from Baking Mischief I knew I wanted to make a healthier version. 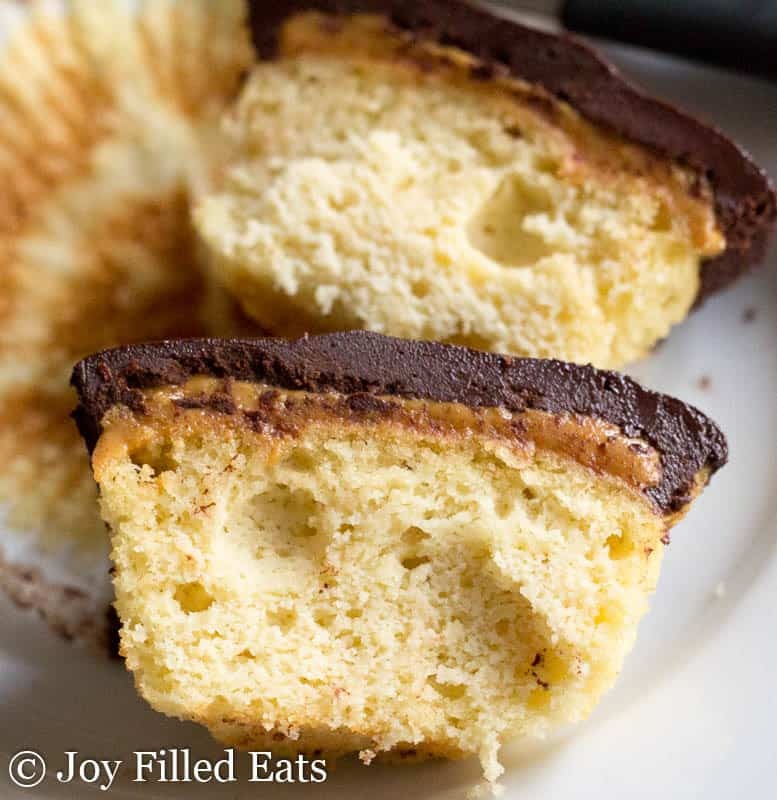 I really liked using plain white paper liners for these chocolate peanut butter cupcakes so that I could see all the layers. Feel free to use any liners that you prefer or just bake them right in the tin. If you decide to bake them right in the pan make sure to grease the pan well. 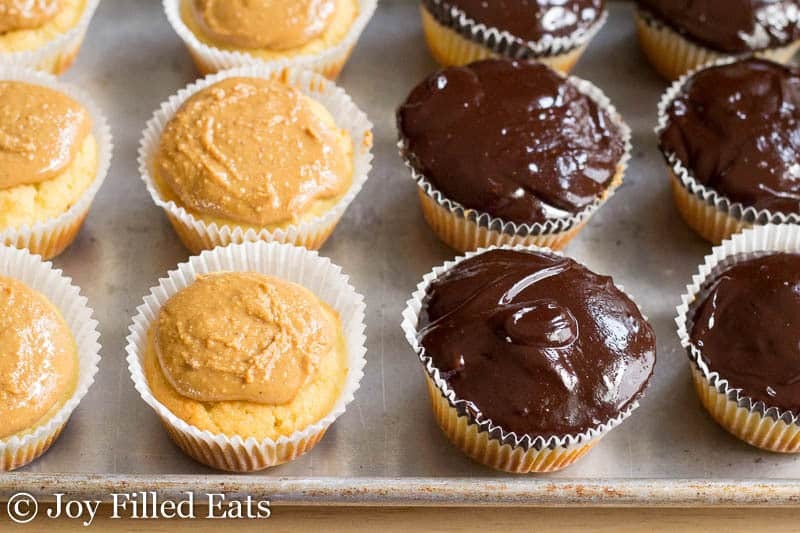 Pop the tagalong cupcakes out before adding the peanut butter and ganache. If you are feeling more like a chocolate base than a yellow cake base you can sub in the cupcake base from this recipe for my Dark Chocolate Peppermint Cupcakes. You will need to double it to make 12 cupcakes. 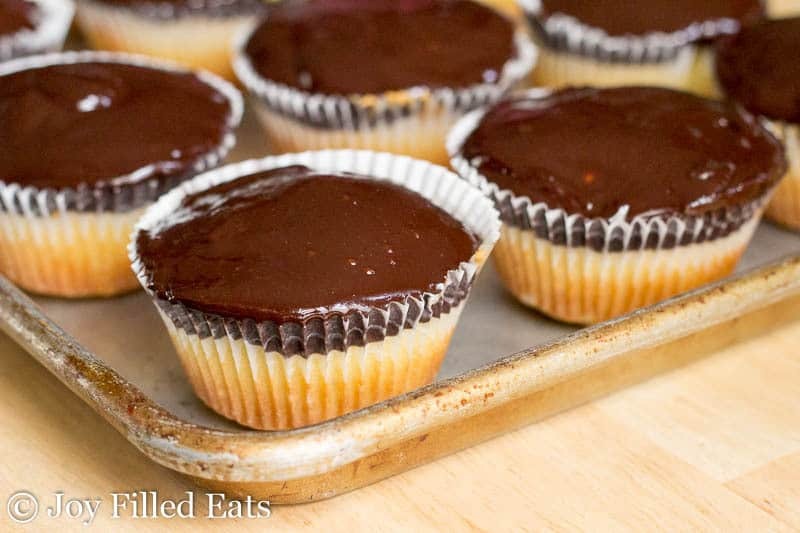 Can anything be better than that beautiful chocolate and peanut butter covered cupcake? Preheat the oven to 350. In a bowl with an electric mixer cream the butter and gentle sweet until light and fluffy. Add the sour cream and vanilla and beat until combined. Add the eggs and mix well. Stir in the flours, baking powder, and salt until thoroughly combined. 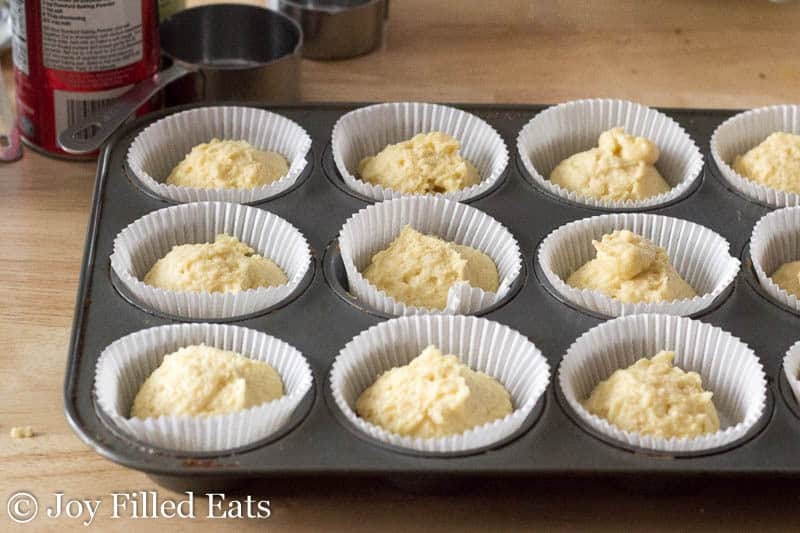 Divide batter between 12 muffin cups lined with paper liners. Bake at for 30-35 min. Let cool completely. Stir together the peanut butter and sweetener. Divide between the cupcakes. Chill in the fridge for at least 30 minutes. Melt the chocolate in a glass bowl in the microwave stirring every thirty seconds. Alternatively, you can melt it in a double boiler on the stove top. Warm the cream in the microwave until it is about the same temperature as the chocolate. Use an electric mixer to incorporate the cream into the melted chocolate. Add the sweetener and mix until smooth and shiny. It should be about the consistency of hot fudge. 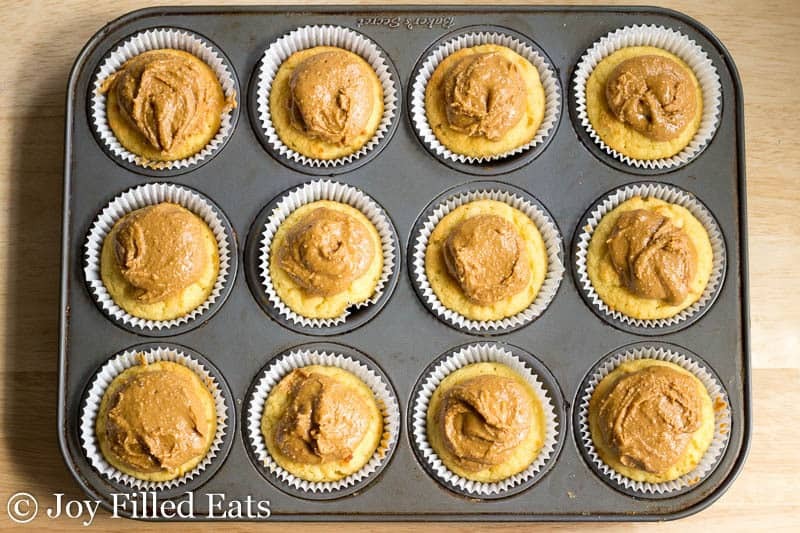 Spoon a big blob of chocolate on top of each peanut butter topped cupcake. Gently spread it to cover the peanut butter. You may have leftover ganache. You can use it like hot fudge, dip strawberries in it, or eat it with a spoon. If you want to avoid having leftover ganache you can make 2/3 of the chocolate recipe. I, personally, have no problem using up extra melted chocolate. MFP doesn't subtract the sugar alcohol. I subtract those manually. Thank you! Thank you for sharing this recipe. It has kept me from going off plan. The best low carb recipe I’ve ever had! Also, do you think these would freeze well? I am curious about this too!! 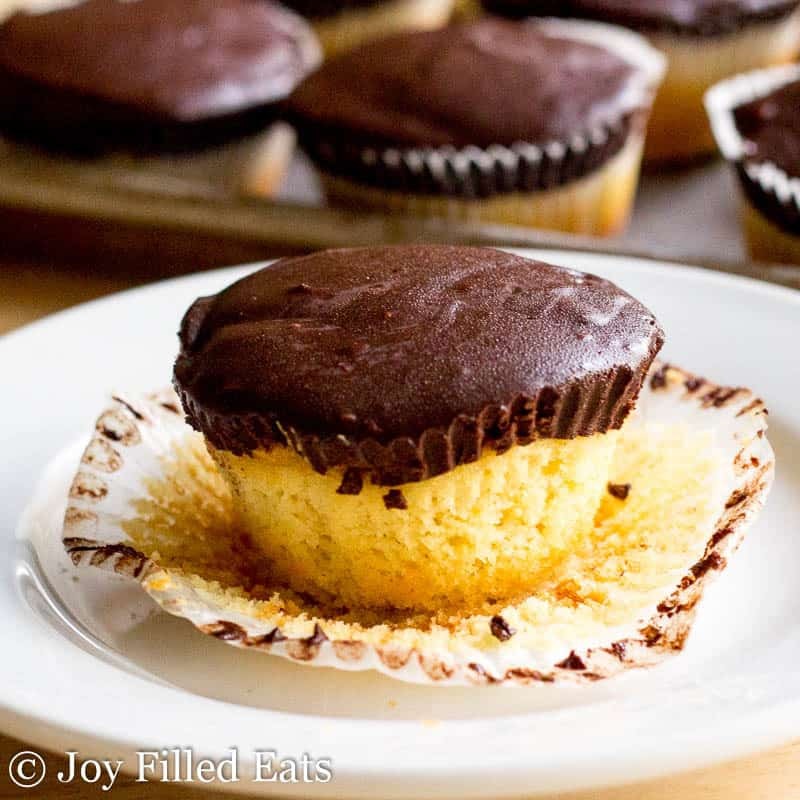 Yes, cupcakes do freeze well! These should too. I made these last night but used erythitol and monk fruit. They turned out soooo good. Very rich but I think I'll use less icing next time. T So glad I came across your site. I can't wait to try some of these yummy looking recipes. Desserts are my downfall and now I can have some. I am looking for recipes that are diabetic friendly and think I can have some of these. Wish I could find lactose free whipping or heavy cream. Thank you for sharing.